Should you play music in your yoga class, or not? This is a highly debated topic (I know, right?!) but is worthy of discussion. It is my opinion that music in a yoga class has its time and place. When the teacher selects a specific track to play when we are in half pigeon, music can transform half pigeon from a chore to a catharsis. 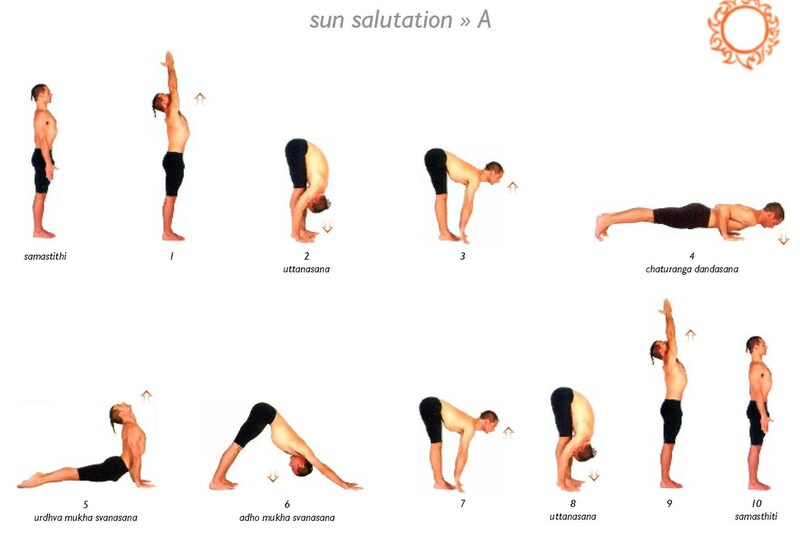 Similarly the rhythm of the music playing can make sun salutations a mellow, mindful series of movements, or it can uplift them into a cardio workout flow. 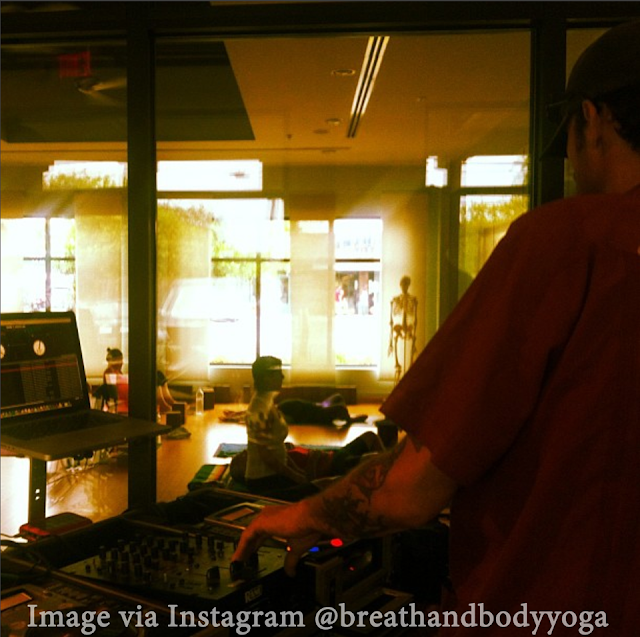 Every so often, the studio where I practiced in Austin, TX (Breath and Body Yoga) would bring in a live DJ and we'd have a detox class with jamming tunes (see photo above). It was a ton of fun, but was very different than the daily yoga practice I had there. It was a party atmosphere and it brought in a lot of new yogis to the studio. I prefer strategically placed music in class, and definitely music without words. I find non-instrumental tracks very distracting when I'm trying to hear the verbal cues the teacher is giving in class. I also find it hard to teach over a song with words. I have to be louder than the lyrics in the song. Sometimes fun, mostly not so much fun. I thoroughly enjoy a yoga studio filled with yogis breathing ujjay breath, moving together, and me being able to hear that they are breathing instead of holding their breath. There's also the problem of copyright. When you play music in a yoga studio, that constitutes a 'public performance' and technically royalties should be paid based on the number of yogis in the class. While it may be unlikely that your studio would be served with a "pay up" letter from the ASCAP, it could happen. Music also presents a problem even when it is in the background of a yoga studio class recording. The owner of the copyright has the legal right to monetize the video you've uploaded as a result of the YouTube audio algorithm detecting use of copyrighted music. IF you want to use music in your classes, and want to use instrumental music but don't know where to turn for upbeat, instrumental tracks - I'm going to share what I've created so far. If you want to follow me on Spotify, you can be kept up to date on any new play lists I make going forward. I've made quite a few playlists for my yoga classes. Originally the songs were chosen for their tempo and length because each one was selected to go along with Sun As, Sun Bs or balancing poses. Once I'd figured out class pacing, I relied less on the length of the song but more in hitting the right time in the playlist for the class to be in a hip opener pose like half pigeon (it seems to be right around the 43 minute mark in most of my classes). Recently I sent out a Survey Monkey questionnaire to the yogis who have taken my classes as of late (which have primarily been with no music) and the feedback that I received is that people wanted more music. I'm glad to indulge, so I put together a few more playlists with instrumental tracks leading up to hip openers and then closing with something moody and mellow for savasana. I'll provide links to the different playlists I have online, in case you wanted to use them when you teach a 60 or 75 minute class. If the jack-booted ASCAP enforcers show up during yoga, give them a mat. They'll leave feeling inspired and will only berate you slightly for not paying into their overflowing coffers.